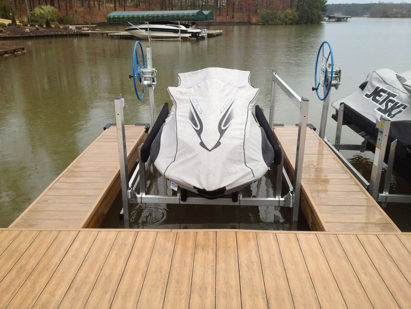 Jet Ski Lifts are easy to use and operate, low profile and long lasting. We sell the RGC VL1250 Jet Ski Lift with 1250lbs capacity including a 2500lb large capacity winch, carpeted bunks, carpeted guide ons and either hand wheel or motorized options (also available with remote control). EZ Port MAX 2i features a revolutionary self-centering design that allows for smooth and effortless loading and unloading. 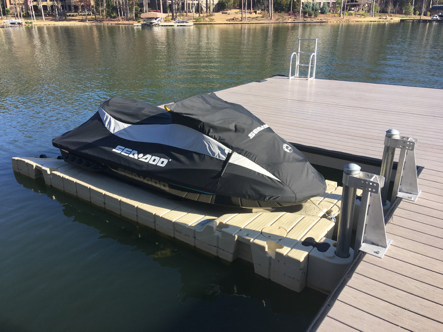 EZ Ports can be linked together to accommodate multiple jet skis and are virtually maintenance free. The polyethylene ports are durable, slip-resistant, chemical-resistant, and completely wood-free. They won’t splinter, rot, or need paint.